steel reinforcement for the environment in the region. Saudi Aramco, a global leader in petroleum and natural gas, recently implemented the corrosion-resistant fiber-reinforced polymer (FRP) rebar in the foundations of a 400-metre long perimeter in one of its construction projects. The FRP rebar was much faster to construct than conventional steel rebar due to its lightweight and prefabricated nature. In a parallel effort, Engineering Services, Project Management, and Procurement and Supply Chain Management are undertaking a major initiative to use FRP rebar in a 21-kilometer long storm water drainage channel in the Jazan Economic City project. Once constructed, it will be the largest project ever to be constructed using FRP rebar in the world. Corrosion resistant fiber-reinforced polymer rebar is an ideal replacement of steel reinforcement for the aggressive environment in the region. At only one-quarter the weight of steel, it is easy to transport and construct. The FRP rebar has brought a concrete construction revolution that is in full alignment with Saudi Aramco efforts to promote non-metallic solutions. The corrosion resistant rebar is an ideal replacement of steel reinforcement for the aggressive environment in the region. And at only one-quarter the weight of steel, FRP rebar is easy to transport and construct. 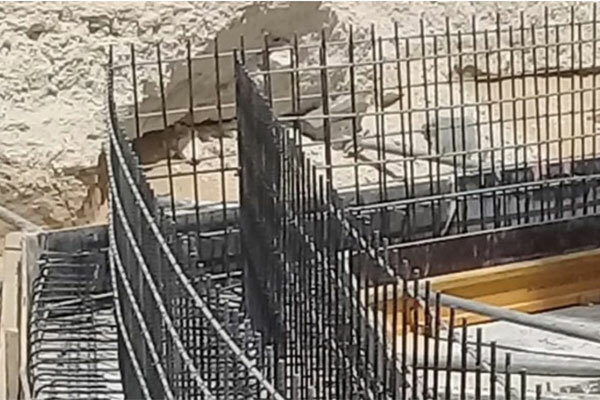 Realizing the many benefits of FRP rebar in construction, Saudi Aramco has recently mandated FRP rebar be included in its engineering standards for noncritical structural members such as slab on grade, drainage channels, sidewalks, and pipe sleepers. Consequently, extensive efforts are being exerted to localize the manufacturing of the FRP rebar to meet the increasing demand. As a result, many international manufacturers have submitted plans to build manufacturing facilities in Kingdom. FRP rebar simply consists of fibers (glass or carbon) embedded into a matrix (polymer). These rebars are manufactured by a process called pultrusion — a process that involves the pulling of the fibers through a liquid resin and then passing them through a heated steel die. The resin, an oil-based product, acts as a “binder” to hold the fibers together and transfer the load to the fibers. The fibers provide the strength and other mechanical properties. The final product is tested and qualified to verify mechanical properties, bonding with concrete, and durability.